The three advance measurement features that make these counters stand out from any other universal counters that are available today are the 20 psec single shot resolution (SSR), gapless sampling up to 1 MS/s, and the pulsed RF/microwave measurement capability. The 20 psec SSR is an industry leading timing spec. Working for Agilent I had the privilege to start testing these marvels out months ago and I can tell you that the typical SSR is about 10 psec (Agilent is always conservative on the specs). Keep in mind light only travels 3 mm in 10 psec! Now SSR resolution is most often associated with time interval measurements, but every counter measurement basically comes down to timing so the better the SSR of a counter the more digits of resolution you get in frequency and any other measurement. Gapless sampling means there is no dead time or re-arm time between gate times, basically there is no gate time. 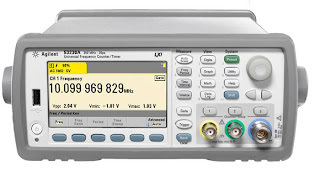 This allows the 53230A to make true Allan deviation measurements. Gapless sampling also gives the user the ability to pull the gapless time stamp measurements from the instrument’s memory and perform modulation domain analysis (MDA). Finally the 53230A has optional pulsed RF/microwave measurement capabilities for measuring pulse width, pulse repetition rate, pulse repetition interval, and carrier frequency. This capability is invaluable for radar and electronic warfare applications. The 53200A series has a large LCD color display and a user interface similar to that of a scope with a hard-key / soft-key layout. The large display increases the usefulness of the universal counter by displaying more data in more intuitive ways instead of just the traditional long string of numbers. As an example see the histogram and trend chart screen captures from the 53200A series. The large display also makes it easy and quick to navigate through menus for a more user friendly experience when accessing some of the more advanced features of a universal counter. That is all for now but you can count on seeing more posts pertaining to this new counter family in the near future. For more information on the 53200A series check out the link below. If you are looking for more information on this topic, visit this site, my friends. I would like to read the full article about it. It's such a useful tool for me!